Pedal Power | Arts and Culture | Style Weekly - Richmond, VA local news, arts, and events. Greig Leach, official artist for the 2015 UCI Road World Championships, talks about how he got into painting speed. 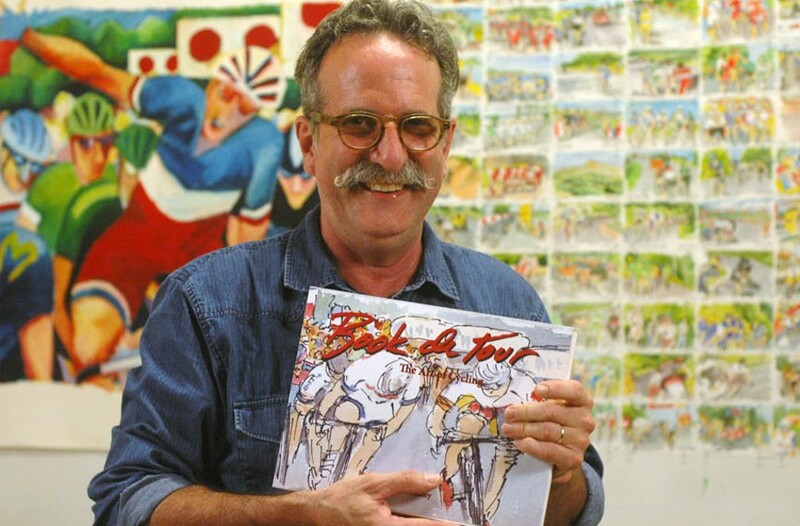 Artist Greig Leach holds up a copy of his Kickstarter project, “Book de Tour,” which depicts moments from the 2014 Tour de France. From the legions of hipsters on fixed-gears to the debate over the proposed Floyd Avenue bike boulevard, one thing is certain: Richmond is passionate about bicycles. It's this love that local artist Greig Leach is tapping into with his Book de Tour, a Kickstarter project that will publish his watercolor-and-ink paintings of the 2014 Tour de France. Leach raised more than $20,000 to print his 192-page book, which colorfully chronicles each stage of the race. A former racer himself, Leach posts his bicycle paintings on his blog, the Art of Cycling. Style Weekly: Why is cycling so important to you? Leach: A bike has always been part of my life. That feeling of being out there and riding, there's nothing like it. It's freedom. I started racing when I was 15. It was the mid-'70s, back when no one in the U.S. knew what bike racing was. In the D.C. area I raced. I last raced in that very long-running Bryan Park series every Tuesday. I crashed spectacularly and decided I didn't want to do it anymore, but I raced '74 through '79. I was in college, I was about to get married, working full time, going to school full time and making art. I thought something had to give, and that I'd never be good enough to be a professional racer. In '79, that was not a viable option in the United States. I still ride 50 to 100 miles a week. Why are you so captivated by the figure in motion? Watching people interact and then then painting that interaction has become very intriguing to me. I've painted a lot of musicians and people dancing. It's fascinating to me to see something and turn that into a static moment, but still have that moment convey all of the speed and emotion, movement, interaction. That's a real interesting challenge, and one I continue to investigate. The cycling [art] has become intriguing to me — trying to capture the incredible speed, these daredevil descents down these alpine mountains, to take a static image that shows all of the energy and that juxtaposition of motion and stillness. When did you decide to put your two passions together? My wife and I had decided to take a trip through Europe for a month with our children. We had all the money for the housing, the transportation, the flights — then realized we didn't have any money for food. We came up with the idea of pre-selling watercolor postcards that we would mail back to our clients, and that worked out really well. In 2012, while watching the tour — I'm a workaholic — I was sitting there going "I love watching the tour, this is great, but I'm just sitting here for four hours a day watching TV." It was driving me bonkers. My wife said "Why don't you paint the tour and see if you can sell it on Facebook?" The next cycling season I started doing the blog and selling art that way, and so it's all sort of grown. What do you make of this year's tour? This tour has been stunning. There's never been a tour where three of the favorites have pulled out. A lot of people are pooh-poohing [Vincenzo] Nibali's win, but he won the Giro d'Italia 2013, and he won it in the same way. The thing about the tour is that you have to finish every stage, and the guy who does is the guy who wins. Yes, [Chris] Froome crashed out and yes, [Alberto] Contador crashed out, but Nibali didn't, and so that makes him the winner. He finished in the least amount of time. How did you become the official artist for the 2015 UCI Road World Championships coming to Richmond? To see Leach's Kickstarter page, go to kickstarter.com/projects/1335072134/book-de-tour.